ATLANTA – Matt Ryan’s TD pass to Mohamed Sanu with 31 seconds left lifted the Falcons to a 33-32 victory over the Packers on Sunday at the Georgia Dome. The see-saw affair did not go Green Bay’s way at the end, and the Packers fell to 4-3 on the season. Packers QB Aaron Rodgers completed 28-of-38 passes for 246 yards with four touchdowns. He also led the Packers with 60 yards rushing. WR Davante Adams had 12 catches for 74 yards, and WR Jordy Nelson added four grabs for 94 and a TD. Ryan as 28-of-35 for 288 yards with three TDs, with Sanu catching nine passes for 84 yards and the game-winning score. Green Bay’s defense had its best sequence of the game to start the fourth quarter, as DTMike Daniels and LB Julius Peppers sacked QB Matt Ryan on back-to-back plays, leading to a punt. Packers S Kentrell Brice was called for a facemask penalty on the punt return, though, pushing the offense back to its own 14 to start the next drive. The Packers got going again on an 11-yard scramble by QB Aaron Rodgers and an 11-yard reception by WR Davante Adams. Rodgers then hit WR Geronimo Allison for 17 yards for a first down across midfield. After FB Aaron Ripkowski carried twice for 7 yards, Rodgers scrambled for 13 more for a first down on the Atlanta 24. A pass of 6 yards to WR Jeff Janis set up third-and-4, and the Packers caught the Falcons with 12 players on the field, thanks to a successful replay challenge. That made it first down on the Atlanta 13. Ripkowski carried twice for 6 yards, and then Rodgers found WR Jeff Janis in the back of the end zone for a 7-yard TD with 3:58 left. The Packers went for two points, and Rodgers ran a play-action keeper for the score, putting the Packers ahead, 32-26. The Falcons got started with passes of 9 yards to WR Mohamed Sanu and 13 yards to WR Justin Hardy. Packers CB LaDarius Gunter nearly had an interception on a pass for Sanu, but the Falcons then gained 8 yards on a screen pass to RB Devonta Freeman. Ryan hit Sanu for 12 to move the chains and make it first down on the Green Bay 33, and there was an injury timeout for Gunter. Ryan hit Sanu again for 9 yards to the 24, taking it to the two-minute warning, and Gunter returned to the Green Bay huddle. A short pass of 1 to Freeman picked up the first down, and a 9-yard pass to Sanu made it third-and-1 on the 14. A 3-yard pass to TE Austin Hooper moved the chains again for first down on the 11 as the clock ran under a minute left. Ryan then found Sanu in the back of the end zone for an 11-yard TD with 31 seconds to go, and K Matt Bryant’s extra point put the Falcons up, 33-32. The Packers couldn’t pick up a first down on their final desperation drive, and that was it. The Falcons headed into the fourth quarter with a 26-24 lead over the Packers on Sunday at the Georgia Dome. The Packers got across midfield on their first drive of the third quarter, as QB Aaron Rodgers scrambled for 8 yards and FB Aaron Ripkowski rumbled for 12. But Falcons DE Adrian Clayborn sacked Rodgers on third-and-6, forcing a punt. The Falcons drove right back down the field. A 10-yard pass to WR Taylor Gabriel moved the chains and a 26-yard run by RB Terron Ward got Atlanta into scoring territory. Four more running plays in a row picked up 14 yards, and then QB Matt Ryan found Ward all alone on third-and-6 from the 12. Ward took it all the way to the 1 for first-and-goal, and on third down, RB Devonta Freeman scored to put Atlanta back on top. K Matt Bryant’s PAT made it 26-24 Falcons with 3:31 left in the period. The Atlanta drive covered 80 yards in 14 plays and consumed 7:31 on the clock. Two receptions by WR Davante Adams picked up 21 yards and got the Packers near midfield again, but a run and short pass lost yardage, and Clayborn got his second sack of the quarter on the final play on third down, forcing the Packers to punt. The track meet continued in the second quarter at the Georgia Dome on Sunday, and the first half ended with the Packers ahead, 24-19. Beginning the quarter on the Atlanta 24, the Packers took it in for the score. A 10-yard reception by RB Knile Davis followed by a 9-yard catch-and-run by WR Trevor Davis made it first-and-goal. On third down, QB Aaron Rodgers found rookie WR Geronimo Allison for a 4-yard TD to put the Packers back on top, 14-10. It was Allison’s first NFL reception. The Falcons once again came right back. A 24-yard pass interference penalty on CB LaDarius Gunter covering WR Julio Jones got the drive started, and a 10-yard run by RB Terron Ward plus an 11-yard reception by WR Mohamed Sanu got the Falcons into field-goal range. The Packers got back-to-back tackles for loss on running plays to set up third-and-long, and Jones was tackled after a 5-yard reception by Gunter. K Matt Bryant came on to make a 40-yard field goal, pulling the Falcons within 14-13 with 8:52 left in the half. The Packers went three-and-out, producing the first punt of the game. Rodgers was sacked on third down by LB Vic Beasley. The Falcons then went three-and-out as well, with CB Demetri Goodson breaking up a third-down pass. Atlanta’s punt was returned by Davis 55 yards to the Atlanta 15, putting the Packers in the red zone. After a defensive holding penalty on the Falcons made it first-and-goal on the 7, the Packers caught a break. Adams caught a short pass but fumbled, and the ball went out of bounds before the Falcons could recover it. On the next snap, a scrambling Rodgers found Davis just inside the far pylon for a diving 9-yard TD catch, and the Packers led 21-13 with 4:22 left in the half. The Falcons got moving again. Passes of 9 yards to RB Devonta Freeman and 14 yards to TE Austin Hooper preceded a roughing-the-passer penalty on DE Datone Jones . An 11-yard pass to WR Taylor Gabriel and a 5-yard run by Ward put the ball on the Green Bay 22 at the two-minute warning. A 17-yard pass to Hooper made it first-and-goal on the 5, and Freeman finished it with a 5-yard TD catch. QB Matt Ryan was sacked on the two-point try by LB Julius Peppers, making the score 21-19 Packers with 27 seconds left. Rodgers scrambled for 23 yards on the first play of the ensuing drive, and he hit WR Jordy Nelson over the middle for a juggling catch, good for 21 yards to the Atlanta 31. The Packers called their second timeout of the half with 9 seconds left. FB Aaron Ripkowski took a handoff for 9 yards, and the Falcons were flagged for a late hit, putting the ball on the 11 with 4 seconds left. K Mason Crosby was good from 29 yards out on the final play of the half, putting the Packers up, 24-19. ATLANTA – Both teams moved the ball up and down the field to start Sunday’s game at the Georgia Dome, and the Falcons took a 10-7 lead into the second period with the Packers driving for another score. The Falcons got on the board first. A 14-yard pass to WR Mohamed Sanu and a 10-yard scramble by QB Matt Ryan picked up two first downs. After back-to-back illegal formation penalties on Atlanta, TE Jacob Tamme gained 13 yards on third-and-14, and he injured his shoulder on the play (return questionable). On fourth-and-1, the Falcons went for it and an outside pitch to RB Devonta Freeman fooled Green Bay’s defense for a 17-yard gain, but the Packers held there. A deflected pass by LBNick Perry and a solid tackle by CB Demetri Goodson on third down led to a 36-yard field goal by K Matt Bryant for a 3-0 Atlanta lead. The Packers quickly answered. After RB Don Jackson picked up a first down with a 7-yard run, QB Aaron Rodgers hit WR Jordy Nelson deep for a 58-yard gain to the Atlanta 7. Two plays later, Rodgers found Nelson again for a 5-yard TD, and the Packers took a 7-3 lead with 6:08 left in the quarter. The Falcons needed just three plays to answer right back. A pair of passes to WR Julio Jones picked up 24 yards, and then WR Taylor Gabriel went deep. Ryan’s perfect throw beat CB Demetri Goodson, and the 47-yard TD pass put the Falcons back up, 10-7. The Packers got right back on the move. Passes to Nelson for 10, WR Davante Adams for 10, WR Trevor Davis for 6, and WR Jeff Janis for 10 put the Packers on the Atlanta 35. After a loss of 6 on a shovel pass and a false-start penalty, Rodgers hit Adams coming out of the backfield for 22 yards to pick up a first down at the Atlanta 24 as the quarter expired. ~Green Bay — Ty Montgomery was in the stands at Texas Stadium on Oct. 27, 2002, when Emmitt Smith became the NFL’s all-time leading rusher. Montgomery was 9 years old, a Dallas resident and an impressionable Cowboys fan, and he idolized Smith and the man whose record Smith broke. As a senior at St. Mark’s School of Texas, Montgomery rushed for 893 yards and averaged nearly 10 yards a carry, but his days as a running back were about to end. At Stanford, he was a receiver and kick returner, and the Green Bay Packers drafted him in the third round in 2015 with those roles in mind. 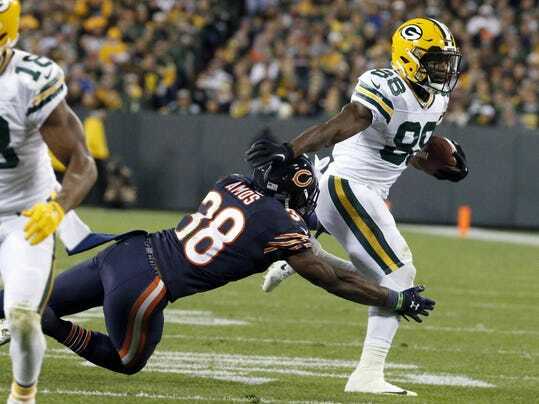 However, necessity being the mother of invention — and position changes — Montgomery found himself primarily in the backfield Thursday night and played a pivotal role in the Packers’ 26-10 victory over the Chicago Bears. With Green Bay running backs falling like dominoes, Montgomery lined up alongside quarterback Aaron Rodgers in the shotgun more than 40 times, rushed nine times for 60 yards — including a 30-yarder, the Packers’ second-longest run of the season — and caught 10 passes for 66 yards. Which just proves that you can take the running back out of the backfield, but you can’t take the runner out of the back. No question, Montgomery’s background as a running back helped him adjust to his hybrid role. Coach Mike McCarthy had just started using him in a similar fashion last year when the rookie suffered a season-ending ankle injury. At 6 feet and 216 pounds, he’s not going to get 20 carries a game. But with Eddie Lacy and James Starks out, Knile Davis getting a crash course in the offense and Don Jackson promoted from the practice squad only to suffer a wrist injury after just two carries against the Bears, this could be Montgomery’s role for at least the next couple of weeks. Even for the rest of the season? On his 30-yard run, he showed patience until a hole opened up and then wasted no time getting through it. He finally was dragged down by safety Adrian Amos and cornerback De’Vante Bausby. McCarthy has to love what Montgomery gives him, because defenses must prepare for it. Whether he gets carries in formations with three or four wideouts or in a more traditional run package with one or two tight ends and/or fullback Aaron Ripkowski, Montgomery gives the offense another wrinkle. To Montgomery, it’s no big deal. He’s a football player. He’ll play any position he’s asked to play. If the Packers wanted him to play guard or tackle, he’d work on somehow getting in the way. ~The game could be measured in boos and jeers. They began quietly, with a few hundred people, as the 17th pass by quarterback Aaron Rodgers fell incomplete, and his total yardage remained steady at 74 late in the first half. They swelled to a chorus on the Green Bay Packers’ final drive of the half, in the closing seconds, when Rodgers overthrew wide receiver Randall Cobb deep down the left side. They roared in the second half of a game that was, by and large, a one-sided beatdown. First Rodgers threw an inexcusable interception directly into the chest of Dallas Cowboys safety Barry Church. Then he fumbled on a quarterback draw inside the 10-yard line, a few feet from a desperately needed touchdown. The quarterback who for years had been considered the best in the National Football League resembled something worse than mediocrity, and it was, quite frankly, stunning. Across the field, where the Cowboys have begun the season without starting quarterback Tony Romo and No. 1 wide receiver Dez Bryant, the offense hummed like an efficient machine. They dismantled the Packers behind a pair of rookies — quarterback Dak Prescott, a mid-round pick in the 2016 draft, and running back Ezekiel Elliott, chosen fourth overall — immolated a defense ranked atop the league in rushing yards allowed and yards per carry. And in the back end, where the Packers finished without their top three cornerbacks, all of whom were injured, Prescott completed timely passes for crushing gains. It ended in a rout: Cowboys 30, Packers 16. FRISCO – Green Bay’s rushing defense stats are intimidating. Will they hold up, though, against the Dallas Cowboys? The Packers have allowed an NFL-best 42.8 yards per game and just 1.99 yards per carry through four games. Tightfisted, yes. And they’ve allowed just two runs over 10 yards (for 12 and 14 yards). That’s caught the attention of the Cowboys, who visit on Sunday, even though the Packers haven’t yet faced any combination like running back Ezekiel Elliott and Dallas’ offensive line for a full game. The Cowboys lead the NFL in rushing, and they also feature a mobile quarterback in Dak Prescott, who has three rushing touchdowns. “Yeah, I mean, they’re stout,” Cowboys offensive coordinator Scott Linehan said of the Packers’ D. “They’ve got some really, really good players up front in their front seven. And the linebackers stay kind of behind those big fellas up front and clean up a lot of tackles. So the biggest challenge is getting past the first line of defense and getting into second-level runs. Linebacker Jake Ryan leads Green Bay with 31 tackles. At the same time, the Packers have yet to face the opponents’ top running back for four quarters. Chris Ivory, Ameer Abdullah and Rashad Jennings all didn’t play against the Packers due to injury. The Vikings’ Adrian Peterson suffered a torn meniscus against the Packers. The Jacksonville Jaguars mustered 48 yards rushing on 26 carries (1.8 yards per carry). T.J. Yeldon was the leading rusher with 39 yards on 21 carries for one touchdown with a long run of 7 yards. No running back has gained more yards against Green Bay this season. The Vikings totaled 30 yards on 22 carries against the Packers. Also of note — Peterson had 12 carries for just 19 yards before getting hurt in the third quarter. The Lions’ Dwayne Washington had 10 carries for 38 yards and no touchdowns. Detroit mustered only 50 yards on 23 carries. The Giants rushed for 43 yards with Bobby Rainey as the leading rusher with 22 yards. Meanwhile, Elliott leads the league with 546 rushing yards and has five rushing TDs. The Cowboys’ 155 rushing yards per game and 11 rushing TDs also lead the league. The rushing game has been especially potent the last three games, including last week’s win over Cincinnati, when “Zeke” rushed for 134 yards, including two touchdowns. That came against a Bengals defense that hadn’t given up a rushing touchdown in its first four games and was supposed to provide a stronger test to Dallas’ rushing offense. The utter effectiveness of the offensive line, tight end Geoff Swaim and No. 21 showed when Elliott busted a 60-yard touchdown run in the third quarter. Elliott has rushed for over 130 yards in each of the last three games and can become the first rookie in NFL history with four straight 130-yard games if he reaches the mark against Green Bay. The Packers have been typically lining up in their nickel defense this season, but may have to rely on more of their base 3-4 against the Cowboys on Sunday. FOX Sports Wisconsin takes an in-depth look at the keys to this week’s Green Bay Packers game against the Dallas Cowboys. GREEN BAY, Wis. — There are plenty of concerns surrounding the Green Bay Packers‘ offense headed into Sunday’s NFC matchup against the Dallas Cowboys. “It’s usually one or two or three plays that can define your overall performance — or the perception of the performance,” McCarthy said on Wednesday. “This is the game of football. He’s not going to roll it out there every day and be perfect and be Superman,” quarterbacks coach Alex Van Pelt said on Thursday. Not only is Starks dealing with a knee injury, but he’s not with the team. McCarthy said Starks will be out of town until Saturday as he deals with a death in the family. Could Starks even help on Sunday? NOTES: The Packers released No. 3 quarterback Joe Callahan, an undrafted rookie from Division III Wesley. Callahan was later claimed by New Orleans, and now joins John Kuhn as a member of the Saints. McCarthy was not happy about these moves. A corresponding roster move was not made, but the Packers could use it to bolster their depth at running back or activate defensive tackle Mike Pennel or cornerback Demetri Goodson, who are practicing after serving four-game suspensions. To play on Sunday, they must be activated by 4 p.m. Saturday. GREEN BAY, Wis. — The toughest test yet of the season looms on Sunday for the Green Bay Packers‘ league-best run defense. Mike Daniels and the Packers’ defensive front against a Cowboys offensive line that paves openings for rookie tailback Ezekiel Elliott. Lineman Mike Pennel is eligible to rejoin the active roster this weekend after being suspended the first four games by the NFL for violating the league’s substance abuse policy. Pennel was a key backup last season, especially effective against the run. His impending return would mean that Green Bay would have its full complement of linemen again. Tackle Letroy Guion rejoined the starting lineup last week alongside Daniels after missing a game with a knee injury. Kenny Clark, the team’s first-round draft pick, has also played well for a rookie. Hybrid linebacker-lineman Datone Jones has helped fill the void up front. Now Jones may be able to focus more on pass-rushing duties. Either way, Green Bay’s deep group of outside linebackers, led by Clay Matthews and Nick Perry, has extended the wall against the run to the edges. Cowboys coach Jason Garrett has taken notice. The Packers, he said, play well against the run regardless of whether Green Bay is in its base 3-4 defense, or if a fifth defensive back is on the field in what would normally be passing situations. Garrett also likes how his offense has improved running the ball no matter the defense. Ellliott, a 6-foot, 225-pound rookie, will certainly be tough to bring down. But keep in mind that the Packers have already held Vikings running back Adrian Peterson to 19 yards on 12 carries in Week 2 before Peterson got hurt. But facing a mobile quarterback such as Prescott presents the Packers with a new challenge this season. McCarthy said handling the Cowboys’ play-action game will be important. “You catch the ball, you throw it a little more accurately and, you know, don’t throw it away as much. Maybe I should start taking some more sacks. No, you know what, I’ve got to be more accurate and I will. We’ve got to make the most of the opportunities on 50-50 balls and the balls we should catch and complete.” — QB Aaron Rodgers, when asked about his uncharacteristically-low 56.1 percent completion rate through four games, which is 31st in the NFL. WR Randall Cobb was limited in practice with a neck injury after taking a hard hit late in last week’s 23-16 win over the Giants. . . . RB Eddie Lacy (left ankle) and CB Damarious Randall (groin) were also limited. . . . Backup RB James Starks was held out with a knee injury. The Packers have no running backs on the active roster after Lacy and Starks, though they have used Cobb and fellow receiver Ty Montgomery in the backfield at times.